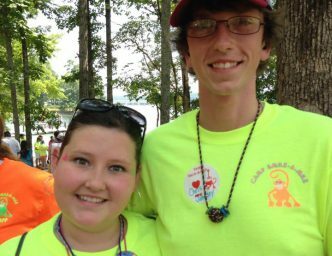 As a thirteen-year-old survivor, I thought my brief struggle with cancer from March of 2009 to July of 2009, not including recovery, was not as important as the struggles of the kids I was about to meet during my first stay at Camp Smile-A-Mile. No one ever made me feel that way, every camper was equal. No matter how much each camper faces we are led to achieve more. When I see the shores of Camp SAM I have hope. When I stand by the lighthouse after our candle lighting ceremony, I grieve in remembrance. No matter what I must overcome in life, I have joy because of Smile-A-Mile and all of those who make it happen. Smile-a-Mile instills hope and strength along with love for my fellow campers and those who stand before me.